This film made for TV, now on DVD is well worth watching, especially if you love social history as I do. The writers of the film were Victoria Wood (actress) and Nella Last who wrote the diaries. I've watched this film 3 times, it's that good. 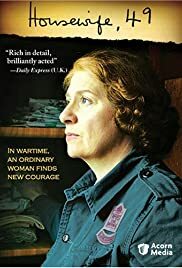 Victoria Wood stars in this World War II drama as Nella Last, a downtrodden wife and mother, whose life dramatically improves with the outbreak of war. A new world opens up to her as she gets involved with the Women's Voluntary Service, helping her to forget her marital difficulties and the absence of her two beloved sons. Some insight is gained into the actuaility of life as it was routinely lived during the 2nd World War in a British Town, that whilst sometimes bombed, did not endure the saturation bombing of London and the places between London and the German airfields. We also gain some insight into the Mass Observation project that invited so called ordinary people to submit their journals of whatever was on their minds as they wrote. Victoria Wood also shows us the extra strain there is in being 'different' and unaccepted in a very class ridden and convential society as we gradually learn one son is a homosexual who endures the loss through death in war of his partner. This is more than a dramatisation of the realities of war but also gives an indication of the stratification of British Society.